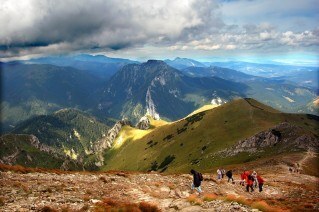 Zakopane - Tatra Mountains tour - Polish Tours & Travel Agency - Greetings from Poland! Zakopane and the Tatra Mountains tour to Zakopane, a mountain resort nestled at the foot of the Tatra mountains and boasting breathtaking views of Poland’s countryside. Zakopane is the winter capital of Poland, thanks to its splendid natural scenery, its hiking trails, and a rich folk culture. You will begin your exploration of the area by taking the funicular railway to the top of Mount Gubalówka for views over the granite and limestone peaks of the Tatra Mountains. Having returned to the oldest part of Zakopane, we will visit the charming wooden old parish church and the most unique cemetery in Poland. To complete your experience, you have a chance to visit the enormous regional market and enjoy lunch in a regional restaurant serving local specialities. If you wish to find out more about this unusual region you can visit the Tatra Museum or the village of Chocholow (famous for its 150-year-old wooden log cabins and a serene atmosphere). Price includes: English speaking guide, hotel pick up from selected hotels, admission to the funicular railway and the Tatra Museum.